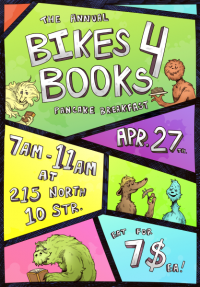 The pancake breakfast helps fund the purchase of bikes for two of our local elementary schools that participate in the Bikes 4 Books program. A total of twelve bikes (one boys bike and one girls bike fro grades 1-6) will be donated to each school. Bikes 4 Books helps promote and encourage elementary age students to read more books. Reading is a fundamental building block to understanding and a direct path to higher education. If a child reads as much as one million words per year, they will be in top 2% of all children on standardized reading tests. If a child reads as little as 8000 words per year, they will be in bottom 2% of all children on standardized reading tests. Therefore, if you read 3,000 words every day you will be in the top 2%. If you read 20 words every day, you will be in the bottom 2%.